The Wang Labs 400-Series electronic calculators were Wang's fourth generation of electronic calculators, following the third-generation 700-series, 500-series, and 600-series. The 400-series calculators were dramatically smaller than their predecessors through the use of Large-Scale MOS ROMs for microcode storage (replacing the ferrite rod ROM of the earlier machines), MOS RAM chips for main memory (replacing magnetic core memory), and the use of medium-scale TTL devices to replace the largely small-scale devices in the third-generation calculators. The 400-series calculators were modeled after the Wang 600-series calculators, offering high-level math functions (depending on the model), a large number of memory registers, and learn-mode programmability with program step capacity of up to 320 steps. 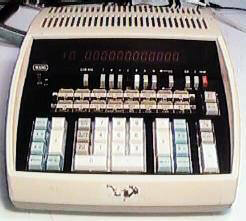 Although the 400-series calculators were capable, competitors, such as Computer Design Corporation (Compucorp) and Hewlett Packard, had introduced calculators prior to Wang's introduction of the 400-series machines in late 1972, which used more advanced technology, and offered significantly more capability than Wang's machines. These market pressures, along with Dr. Wang's realization that the future of electronic calculators lie in the hands of the integrated circuit manufacturers, that led to Wang Labs to gradually move its focus away from calculators, to the new world of Word Processing. Known models in the 400-series are the 450 Scientific, 452 Advanced Scientfic, 462 Statistical and the 487 Surveyor. There may be others that are as yet unknown, as it has been difficult to find information on these machines. The Old Calculator Museum is intrested in acquiring these calculators, or any documentation relating to the 400-series calculators. If you have any of these machines or documentation, please contact the museum by clicking the EMail button in the navigation bar at the top of this page.